Hi!! I'm returning today on the blog to share with you my card for the latest Lawnscaping Challenge. This one was really fun!! Well - they all are :) I am always wanting to "think outside the box" on these challenges, and this one is no exception. For this card - my inspiration was my mom. 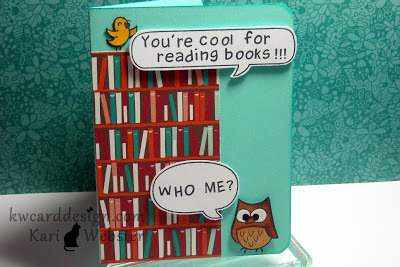 She is the book reader in my family and she loves owls - so I thought this card would be fun to give her and submit for this challenge. 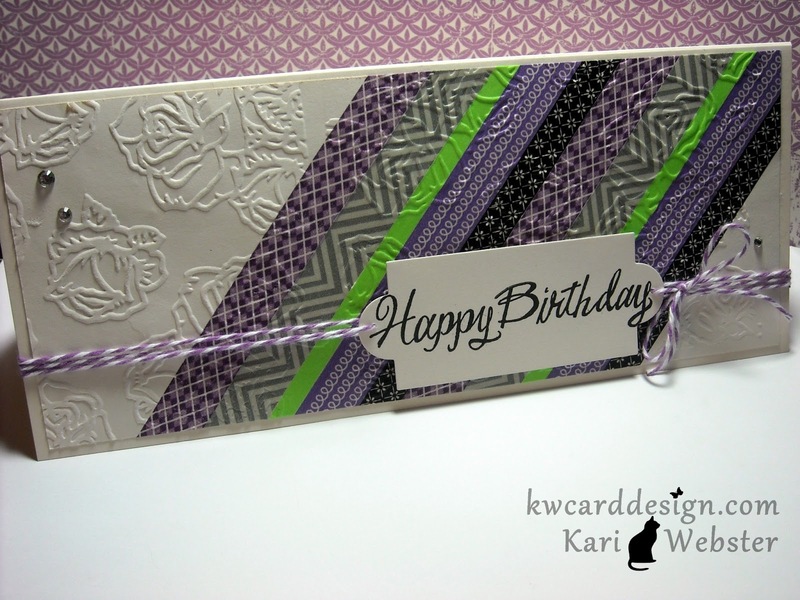 It was a fairly simple card - the longest part with making it would be of course stamping out the custom sentiments. I used some of the pattern paper from the Dewey Decimal 6x6 paper pad. I stamped out my owl from "Critters in the Forest", and did some "altering" on his eyes to make them look like he is a surprised owl. Then, I stamped, cut out and colored my little bird from "A Birdie Told Me" set. 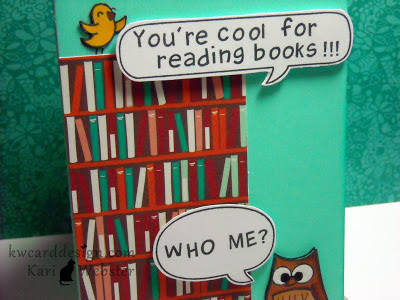 The, I used "Harold's ABC's" for the custom sentiments " You're cool for reading books" - "Who Me"?? I know how much my mother LOVES her books, and I envy her for that. I am more of a magazine girl! HA! It's the weekend!! Time to play with crafty goodies again! 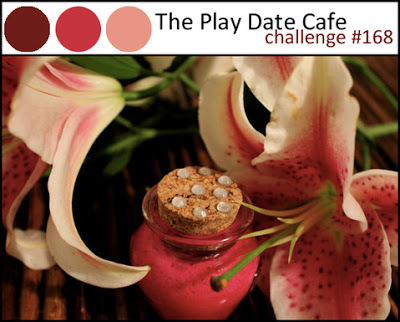 Today I am sharing with you my submission for the latest Play Date Cafe Challenge. I haven't played with them in a while - and I loved the color combination for this challenge. It was also a good reason to play with my one and only Avery Elle stamp set. This is quickly becoming another favorite stamp company of mine. I love their images, and the quality of their stamps. They are growing super fast in popularity ( as they should)! I inked my favorite image of the Fanfare stamp set. I inked it up in this weeks' colors - I used Stampin' Up Rich Razzleberry, PaperTrey Ink Berry Sorbet, and Memento Angel Pink. I die cut the largest heart from PTI Framed Out #11, and inked up the rest of the hearts with the same set in the same inks as before. My sentiment comes from a new stamp set I just got in the mail this past week - Darling Sentiments by Studio Calico/Hero Arts. I mounted my card panel to a Cotton Candy card base. 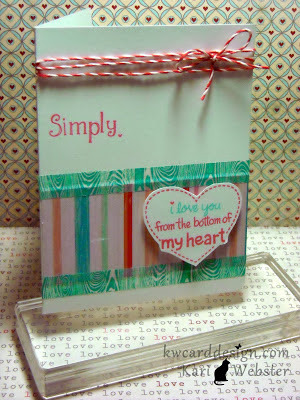 I am also going to enter this card into the SSS Challenge - Have a Heart. It is the first time in a while since I have entered into this challenge. There are so many wonderful entries!! You should check it out and play along too! Hi crafters! I needed to get in some crafty time this Wednesday evening!! What a better way to spend it than to make and submit my next card for the latest Lawnscaping Challenge. As we all know - Valentines Day is right around the corner! There were so many ideas flowing in my head on how I should go about making my card for this week's challenge. But, like last week - I am continuing with my "simple" method! This card I will probably give to my hubby for Valentine's Day. 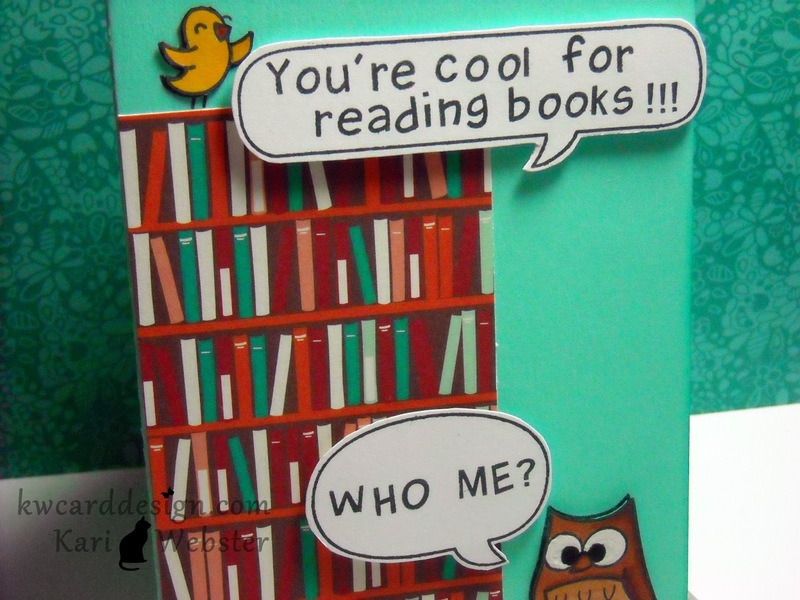 This card is simple and gets the point across! ( and its not too girly!! - haha) I started out stamping the heart sentiment from Many Thanks from Lawn Fawn, but I altered it a bit. Instead of inking the "thank you" part of the sentiment, I opted that out, and added " I love you" from Love 'N Breakfast, also from Lawn Fawn. 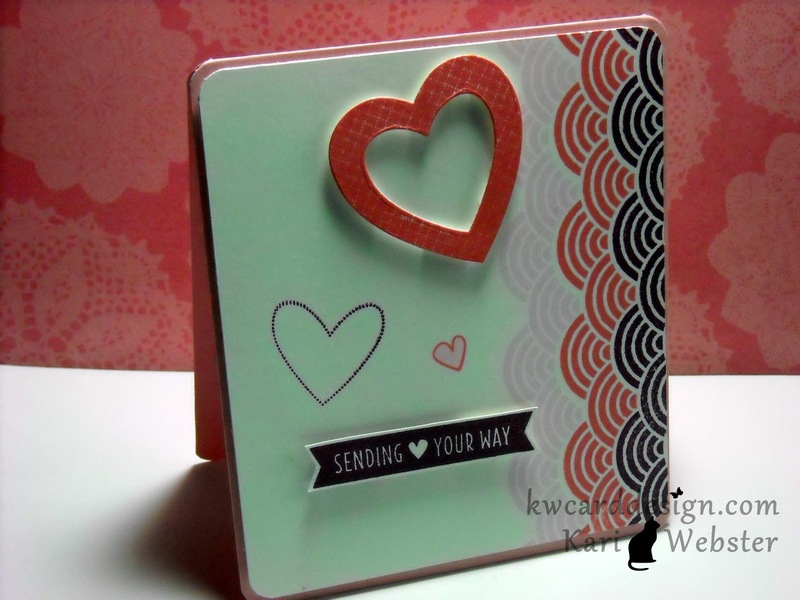 I "fussy" cut my heart out, and then worked on the base of the card. I used some pattern paper from the new My Mind's Eye - Lucky in Love 6x6 pad. I, then added some aqua wood grain washi tape to frame out the pattern paper. 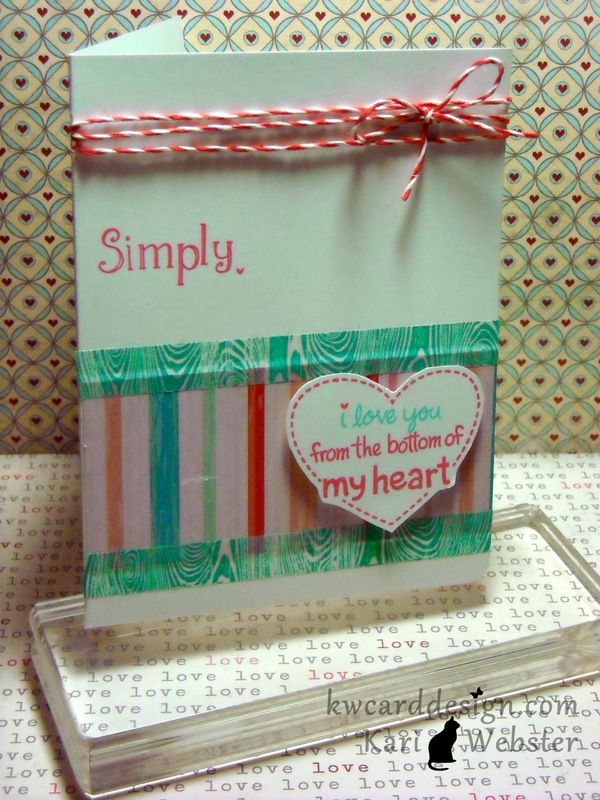 I used Sally's ABC's to add "Simply" to my card base to be apart of my sentiment. To finish the card off I added some Lawn Fawn trimmings in the red and white. I hope my hubby likes it! 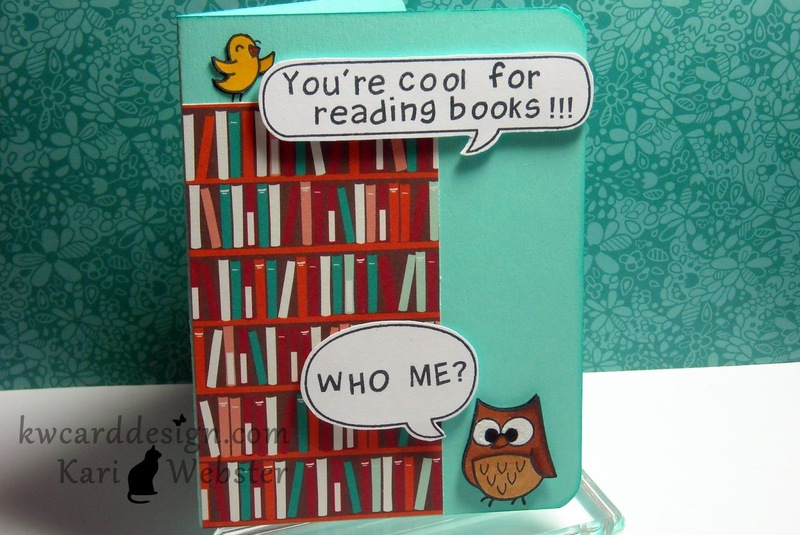 Thank you for stopping in to look at my card!! See you back here soon! Happy Sat! I wanted to pop in quickly and share with you a birthday card I made recently. I am trying to use up all of the washi tape that I have ( which - lets face it, will probably never happen). I am willing to give it a good try though. I made this card for my boss at work. She loves the color purple, and roses and wanted to incorporate both if possible. I used a Hero Arts long note card, and gathered up 5 different washi tape designs and added them to my ivory card stock panel at a diagonal. 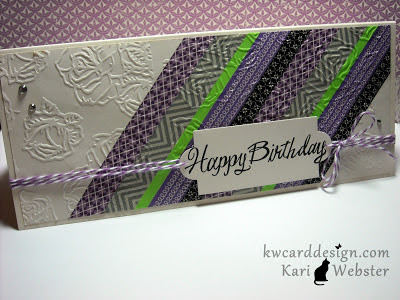 Once I added the washi tape, I embossed the panel with a embossing folder from Lifestyles Crafts in a 2 embossing folder pack from a recent haul. My sentiment comes from one of my favorite Lawn Fawn sets - "Grand Greetings" and stamped that in VersaFine black ink. To finish the card off - I used some lavender bakers twine from my stash, and a few gems stones. 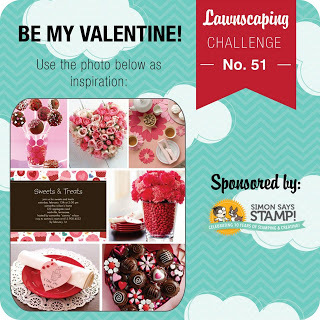 Thanks for stopping by today - I will be back next week with my card for the next Lawnscaping Challenge.